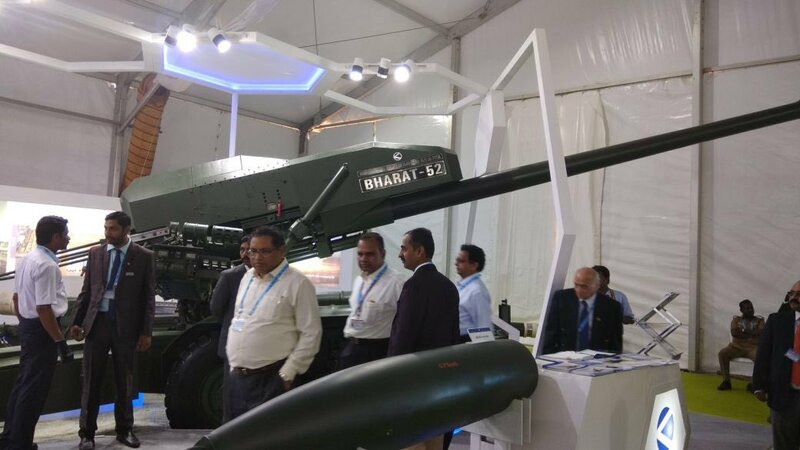 Kalyani Group developed Bharat 52 155 mm/52 caliber towed guns which have been regularly exhibited at defense exhibition across India of late and which has been attracting the attention of the several African countries might soon get export clearance. Kalyani Group might approach the Government of India to grant its Internally developed 155 mm/52 calibers towed gun export permission so that it can be available for evaluations for prospective customers. Kalyani Group, which has partly developed DRDO designed ATAGS 155 mm/52 towed gun in India had acquired dysfunctional Canadian defense firm which had developed GC-45 howitzer upon which the variant called Bharat 52 was developed to be offered as the low cost, local alternative to the Indian Army which for over 30 years had failed to induct any new 155 mm/52 towed guns due to Bofors scam of Rajiv Gandhi government in the 80’s. Bharat 52 features electronic gun controls and a load assist system to improve its gun laying accuracy and rate of fire and has a firing range of about 41 km. Bharat 52 was extensively tested initially in Weapons test range in the United States due to no access to Indian weapons testing facilities but recently was also tested from Proof and Experimental Establishment’s (PXE’s) facilities at Balasore and firing trials at the Ordnance Factories’ facility at CPE Itarsi in 2017. Even though Bharat 52 was developed by a Private company at its Private Capacity which has not seen any direct financial aid from the Indian Government, Export clearance will ensure that Government of India will stand as a sovereign Guarantees to the Exporting country on behalf of the firm and will intervene if and when, if any disputes arises due to payments or spares related issues for which firm will pay a certain amount to the government to facilitate such a deal, if it gets orders for its system.